Dr. Rock's Blog & Roll: Album of the Day: Spirit (1/22/68) 42 Years! Album of the Day: Spirit (1/22/68) 42 Years! Spirit was one of the more adventurous groups to emerge from the Los Angeles psychedelic rock scene in the late 60s. Over 20 years and more than a dozen albums they presented a quirky, amorphous blend of psychedelia, jazz, blues, hard-, folk- and art-rock that benefited first from the emerging, album-oriented FM radio of the late 60s and later from a devoted fan base during the early 70s progressive rock era. 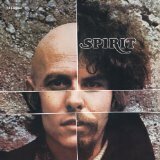 Spirit’s 1968 eponymous debut was released on January 22, 1968 with songwriter/guitarist Randy California and his stepfather, drummer Ed Cassidy leading bandmates Mark Andes (bass), Jay Ferguson (percussion and vocals) and John Locke (keyboards). The album includes the heavy, thumping “Mechanical World,” which was pressed as a single but never caught on. Two better choices for chart action might have been “Uncle Jack” (pop-rock harmony vocals) or “Fresh Garbage” (a rocker in the vein of several contemporary Doors tunes). Two modest hits would come over the next few years with “I Got A Line On You” and “Nature’s Way,” both of which are now staples on the few classic rock radio stations that dig deeper into the period. The revolving door of personnel changes doomed Spirit to remain a might-have-been band and a venue for California and Cassidy’s eclectic genre experimentalism. In 1971 and 1972, Ferguson left for Jo Jo Gunne and a solo career (remember 1977’s “Thunder Island”? ), Andes went to Jo Jo Gunne and then Firefall, and Locke left for Nazereth. The two originals kept at it through the 80s and 90s with several decent art-rock LPs, but with California’s untimely death in 1997, Cassidy called it quits and Spirit’s long-run ended. Spirit spent more than six months on the Billboard album chart through the summer of 1968, peaking at #31. It is available as downloads for iPods and mp3 players on iTunes (click here) and can be purchased as a CD or mp3 downloads from Amazon (click here).